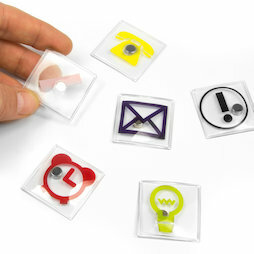 Transparent magnets with colourful symbols for daily use on the whiteboard in the office. A set includes six symbols: phone, letter, lightbulb, exclamation mark, alarm clock and checkmark. 1 pc. 26,89 EUR ea. 1 pc. 20,33 EUR ea.